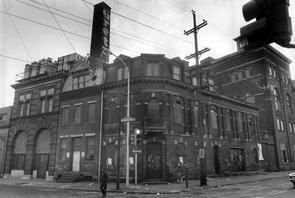 View of boarded-up Gretz brewery from street corner; sign for Germantown Ave is visible; building covered in graffiti. "Gretz" painted on smokestack. Breweries, Factories (structures), Germantown Avenue, Graffiti, Industry (economic concept), Oxford Street, Smokestacks, Streets, Traffic signs, William Gretz Brewing Co.